Pain Physicians NY (Brooklyn, Queens, Manhattan, Bronx NYC) is one of the first practices in New York to offer an alternative treatment for shoulder, arm and hand pain. Depending on severity of the pain, signs and symptoms in addition to traditional treatment options such as muscle relaxants, injections or physical therapy we might offer a cutting edge, non-invasive disc decompression procedure and Platelet Rich Plasma (PRP) injections. Tennis elbow is a medical condition characterized by pain in the wrist and arm, due to an overuse of the tendons in your elbow. It usually occurs due to repetitive motions of the wrist and arm. Tennis elbow is not characteristic just for tennis players. Most of the cases reported were people who did not play tennis but had jobs who required repetitive motions of the elbow and arm, like plumbers, butchers, painters or carpenters. 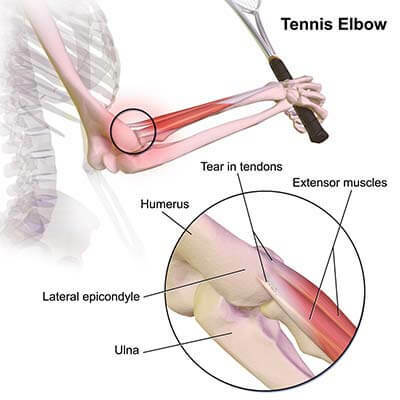 As mentioned before, tennis elbow occurs from an injury and an overuse of the affected arm. Repeated contractions and motions of the elbow and arm lead to muscle strain injuries and even to a tear in the tendons that attach the forearm muscles to the bones at the outside of the elbow. You will be at a greater risk of suffering from tennis elbow if you engage in certain sports like playing tennis, if you are between the age of 30 and 50 and if you have a job that requires repetitive motions of the wrist and arm. Tennis elbow does not occur only to tennis players but also to painters, carpenters, butchers or plumbers. A characteristic symptom of tennis elbow is the pain, usually located in the place where the tendons of the muscles of the forearm attach to the bones, on the outside part of the elbow. Pain from a tennis elbow can also spread to the forearm and wrist. Other signs and symptoms of tennis elbow include: a weakness of the affected hand, stiffness, numbness and a tingling sensation as well as tenderness. Actions like shaking hands, holding a cup of coffee or even turning the doorknob can be very painful and make the pain get worse. If left untreated, tennis elbow can lead to chronic pain and even difficulties performing easy daily tasks like holding a cup of coffee or opening a door knob. Tennis elbow is diagnosed based on a detailed medical history and a physical examination of the elbow, wrist, and forearm of the affected hand. There is no single examination that could diagnose tennis elbow. However x-rays or even MRI of the affected elbow, wrist and hand could help your doctor rule out other possible causes of your signs and symptoms like arthritis or fractures. Sometimes tennis elbow tends to get better on its own, without requiring a treatment. However, over the counter painkillers as well as ice packs on the affected arm can help relieve the pain. Physical therapy is often recommended for the treatment of tennis elbow. Exercises to gradually stretch the muscles and strengthen them can also help when treating tennis elbow. Wearing a forearm brace can also reduce the stress of the injured muscle tendons, helping you recover faster. The most advanced pain management center, Brooklyn pain management doctors and specialists at Pain Physicians NY offer unique, individualized approach to treat your Tennis Elbow pain. We are using the most effective pain management and treatment options to treat arm and hand pain, different forms of arthritis, trigger finger or thumb, frozen shoulder. We are utilizing the latest technologies available in USA.